1 Case of 20 SOS 3600 Calorie Emergency Food Bars. Each of the 20 vacuum sealed packages contains 9 individually wrapped 400 calorie bars ready to eat. 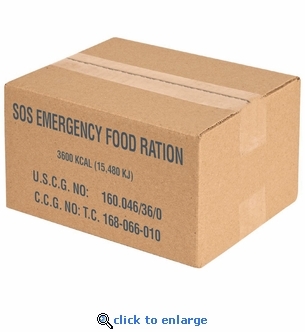 The SOS 3600 Calorie Emergency Food Bars can provide 3 days of survival food during an emergency. SOS survival food bars are economical and made with quality natural ingredients. When faced with a survival situation, a supply of emergency food bars will keep you strong and motivated.